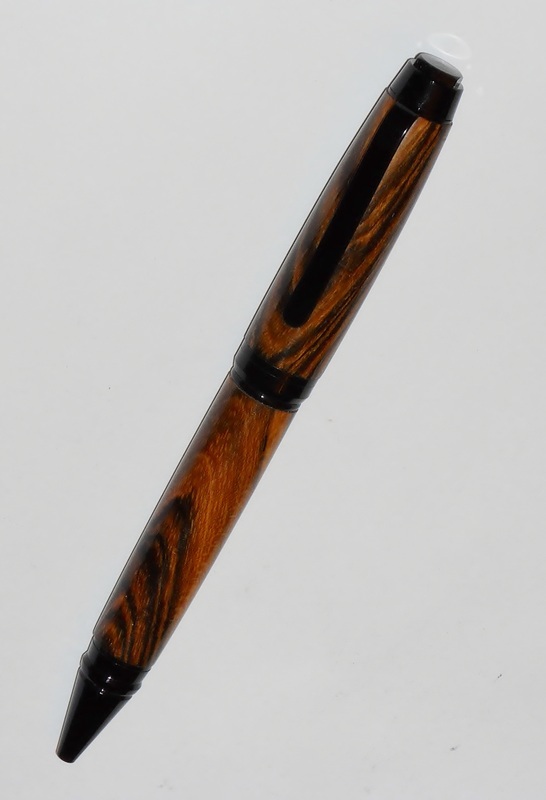 Gold and chrome ultra cigar pen in crosscut desert ironwood. This pen has a durable hard acrylic finish. Gold and chrome ultra cigar with two tone Indian Rosewood burl. A bright cheerful combo that always makes me think of the unexpected goldfinch at the backyard feeder. Crosscut osage orange (bodark) on a Black Ti cigar pen. This cedar came from the old pencil factory on cedar key. The wood dates back to 1868 when the Eberhard Faber Pencil Company mill was built on Atsena Otie Key. This wood is turned from virgin cedar on a black and gun metal cigar style pen. Bocote Ciigar pen in black chrome trim.. Gun metal cigar pen with black line spalted maple. This pen has a durable hard acrylic finish. 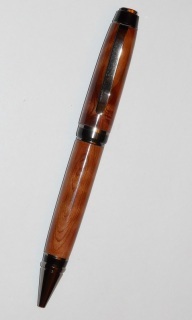 Curly koa cigar pen. Koa is a flowering tree in the pea family, native to the Hawaiian Islands. The wood is highly prized for its beauty, frequently used in musical instruments. White streaked blue mahoe on a black and gun metal cigar style pen. Most blue mahoe is actually more yellow and green than blue and white like this piece. Gold and chrome ultra cigar pen in crosscut pistachio wood. This pen has a durable hard acrylic finish.